Witnesses to the brutal attack said the men responsible stayed on the scene encouraging passers-by to take photos. A tent is erected near the scene of an attack in Woolwich southeast London. SECURITY HAS BEEN increased at all army barracks in London as British counter-terrorism police investigate the murder of a man thought to be a soldier, who was beheaded on a busy London street by two men shouting Islamist slogans yesterday. 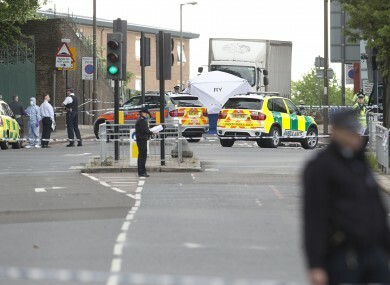 The attackers, wielding knives including a meat cleaver, carried out the attack a few hundred metres from the Royal Artillery Barracks in Woolwich, southeast London, then delivered an Islamist tirade to passers-by. “I apologise that women have had to witness this today, but in our land our women have to see the same. You people will never be safe. Remove your government, they don’t care about you.” The footage, which some people may find distressing, can be seen here. Ingrid Loyau-Kennett, 48, told the Daily Telegraph that when she asked the assailants why they had carried out the attack, one of them told her: “We want to start a war in London tonight”. Around 250 members of the anti-Islamist English Defence League were involved in minor scuffles with police at Woolwich Arsenal train station, near the scene of the attack, before dispersing. Police later arrested two people suspected of trying to carry out reprisals. Officers arrested a 43-year-old man who was detained in Braintree, southeast England, after reportedly walking into a mosque with a knife. They detained another man in nearby Gillingham on suspicion of racially aggravated criminal damage to a mosque, police said. Cameron, speaking to journalists before flying back from Paris, called the attack “truly shocking”. Speaking at a joint news conference with French President Francois Hollande, he added: “We’ve had this sort of attack before in our country and we never buckle in the face of them. Hollande, expressed solidarity with Britain, at “the cowardly killing of a British soldier”, but the British prime minister did not publicly confirm that the victim was a soldier. In London, a local member of parliament, Nick Raynsford, said he understood the dead man had been a soldier. Security was reinforced at all army barracks in London following the incident. Police were called at 2:20 pm to reports of one man being assaulted by two others. Email “Security increased at London barracks after suspected terrorist attack on soldier”. Feedback on “Security increased at London barracks after suspected terrorist attack on soldier”.